Fascinating. I asked in Facebook if I dare re-tell a fairy/folk tale in my new novel, and a whole bevy of friends from widely varied walks of life urged me: Yes! They are witness to the eternal appeal of fairytales (or more correctly folktales) and it was great encouragement to embarking on the writing journey. I’m delighted to discover #folklorethursday on Twitter, yet more witness. Thing is, the novel is also a crime story, but with no gore, so really it’s more of a mystery… with some police procedure and the main character sucked in to being an amateur detective. She’s a story-telling therapist. This brings in archetypes, so I get to treat myself to my shelves of Jung, Joseph Campbell, hero’s journey… as well as Grimm, Jane Yolen, Marina Warner and more. A Body of Knowledge is set in Chiswick. Great fun to see the place where I live through my character’s eyes and sensibilities. So now you are on the writing journey with me as I blog on about the everyday struggles of writing a novel. 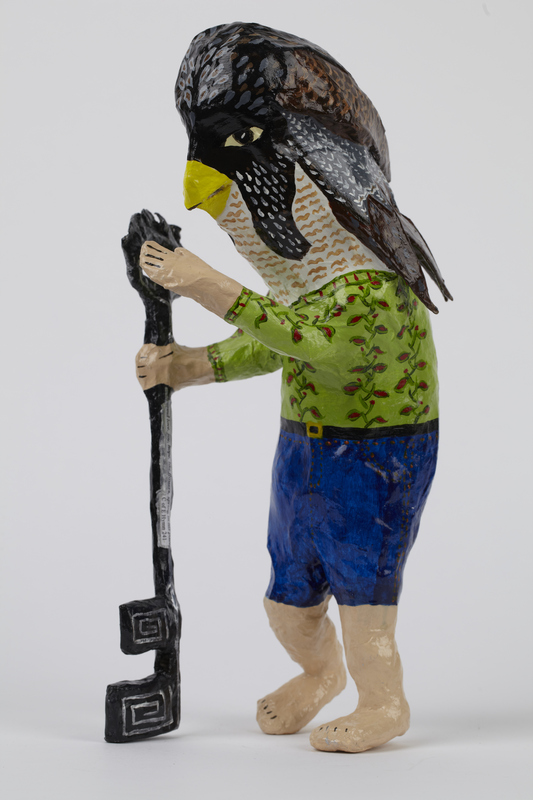 The fellow pictured here is Birdren Boy, one of my sculptural papiermache pieces. He’s on a quest. So am I. Are you?